the team's caution seems to be working because so far, Michael's ankle has been holding up well and he repeatedly says he feels great. (we can't ask for more than that, right?) the DL stint and extra time off, however, resulted in Michael only playing in two-thirds of the games this month. nevertheless, there's a lot of things to discuss and i'm going to get into it all for you shortly. but first, i need to go over some important information. notes: baseball's regular season started a bit early this year, opening on March 29. therefore, in the context of monthly statistics, March and April are considered to be one month. it's the same as when games extend into October at the end of the season, and September and October are combined. this is done because fair comparisons really can't be made when you're measuring just a couple days worth of stats. so whenever you see me write "the/this month" throughout this blog, know that i am referring to both March and April as one single month. 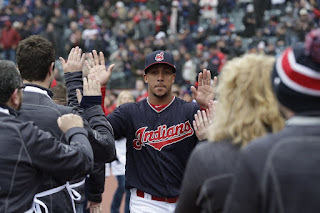 i've used the "March/April" designation in every section of this post as well, regardless of if the subject matter i'm analyzing only occurred in one of the two calendar months AND the fact that Michael did not play any big league games with the Tribe in March. this layout will be the standard for all my blogs throughout the season. the only change you'll see is, starting at the end of May, i will be posting two #s blogs after every month. the first will be the monthly, containing Michael's statistics and information from the most recent month of the campaign. the second will be a cumulative blog, representing Michael's total numbers and stats for 2018 to that point in the year. (ie. April + May #s, then April + May + June #s, and so on.) i didn't always used to write separate blogs, but eventually realized it was imperative for me to divide and provide Michael's numbers from each month along with his overall season stats through each month as the year progresses. confused? trust me--you'll see two completely different set of numbers once you read both posts. when Michael reported to Arizona for spring training, he was still in the process of rehabbing from his offseason right ankle surgery. once he was finally permitted to play with the Tribe, he only appeared in three Cactus League games before camp broke. 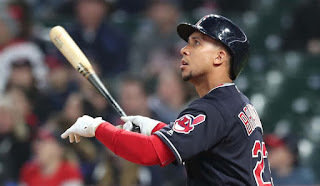 both the Indians and Michael believed the best course of action was for him to remain in Goodyear to keep building up his endurance so that he would be able to take on the workload of an every day left fielder and play complete games upon his return to the Tribe. 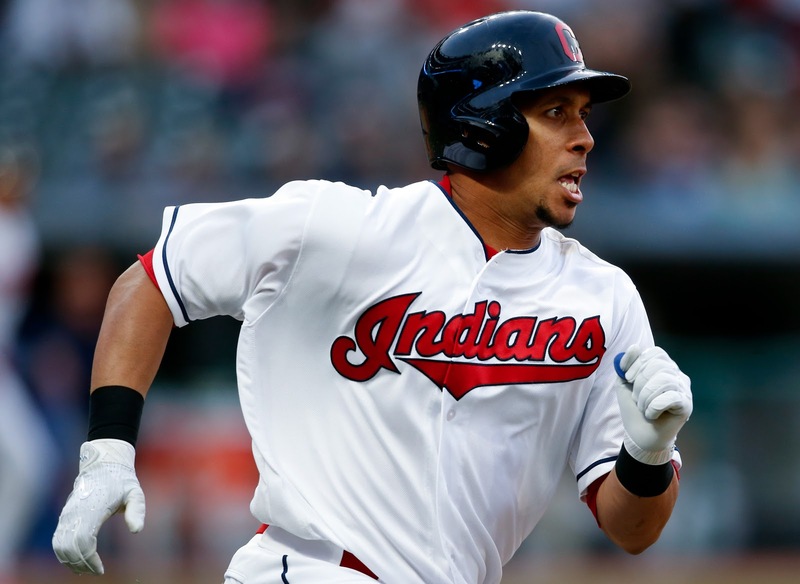 therefore, Michael opened his final season with the Indians on the 10-Day DL. Michael continued to work on baserunning and played in three total games while in AZ. he was in one lineup with the Triple A Columbus Clippers before getting into two contests with the rookie leaguers. the good thing was in his last two games, he played a full nine innings and reported no issues. and so, the Indians decided Michael was ready to be activated in time for their Home Opener. (i included a special section about Michael's season debut at the Tribe's opener in the subsequent section below.) for all the details of Michael's stint on the disabled list, you can read the separate blog i wrote here. even with staying back in Arizona to extend his rehab, Michael still got some extra days off after rejoining the Tribe and he did not play a full month in March/April. that's been a recurring theme for Dr. Smooth for the last four Aprils now. in 2017, he played 20 games in April, but previously played 20 games combined between 2015 and 2016 (15 games and five, respectively). a year ago, he was being eased back into action in April following another shoulder surgery. in 2016, Michael opened the year on the DL and went on through a minor league rehab assignment as he attempted to come back from (his first) shoulder surgery. and in 2015, Michael had a lower back strain that kept him out of a handful of games in April. so he hasn't been around much to start the past several seasons. this month, however, you'd never suspect he'd had an abbreviated spring. in Michael's first nine games between April 6-20, he bat .351 (13-for-37) with three doubles, one home run, six RBI, one walk, and one stolen base. in his last nine games between April 21-30, he bat .333 (11-for-33) with two doubles, one triple, one home run, and four RBI. in total, Michael finished April with a .343 batting average, which is quite impressive considering the circumstances he had to overcome. he also put together several streaks this month including a 14-game hitting streak on the road and 18-game on-base streak on the road, both of which originated from his 2017 season. he had 5 consecutive multi-hit games as well, tying a career high, along with a modest 7-game hitting streak and a 9-game on-base streak. i'd say that qualifies as a top-notch return for Dr. Smooth.😤 now let me get into short summaries of each series of the month. when the Indians started their season on the road, Michael was playing games in extended spring training. 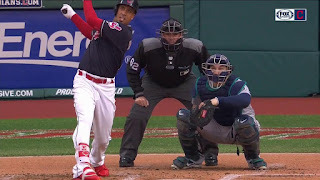 the Tribe played their first three games on the west coast against the Seattle Mariners before flying south to take on the Los Angeles Angels for three games. sadly, the club lost both series, 2-1.
following an off day, the Indians had a 10-game homestand where they were scheduled to face the Kansas City Royals three times, Detroit Tigers four times, and Toronto Blue Jays three times. Michael was activated from the disabled list prior to the Tribe's Home Opener. he appeared in all three games versus the Royals and went 2-for-11 after playing in very cold temperatures. one of his two hits turned out to be a game-winning 2-run single in the opener. be that as it may, once the series was over, one writer, who i'm not even going to acknowledge by name, claimed Michael was "struggling" already. for the love of god, he got two hits in his first three games of the season in frigid weather conditions. and you know what? that's better than some of his teammates were doing in nine total games to that point. haters are everywhere, even in the damn Cleveland media.🤐 smh. 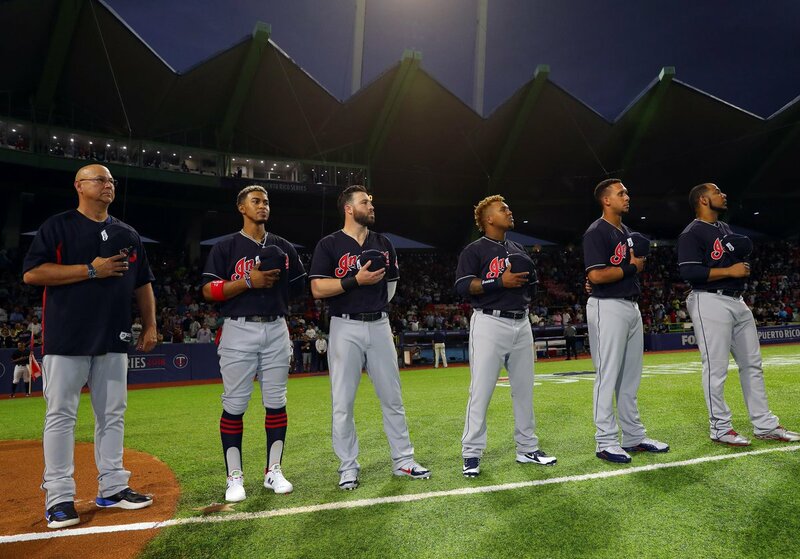 the schedule next sent the Indians to San Juan, Puerto Rico. that's where they played two games against the Minnesota Twins at Hiram Bithorn Stadium (sandwiched in between two days off for travel). after not playing Game 1 versus the Blue Jays, the two rainouts, and an Indians off day, Michael ended up with four straight days of rest. the Tribe was considered the away team in both contests and Michael played both, including the 16-inning affair in Game 2! offensively, he went 5-for-12 with one double, one home run (his first of the year), and two RBI. a four-game set against the Baltimore Orioles followed. Michael played in all of them, getting to play in four consecutive games for the first time this season. sadly, he was rendered hitless in the finale, which put an end to his 14-game road hitting streak and 18-game on-base streak on the road. for the series, he totaled two doubles and two RBI, going 5-for-17. combined with his stats from San Juan, that's a 10-for-29 performance at the plate on this road trip. the Indians returned to Progressive Field for an 11-game homestand, though only seven were in April. it started with a quick two-game series versus the Chicago Cubs, four games versus the Mariners, and the first of three versus the Texas Rangers. Michael got the first Cubs contest off, then went 1-for-4 in the second. he played all four games in the Mariners series, going 7-for-15 at the plate with one double, one triple, one home run, two RBI, and three runs. this was the first time that Michael was permitted to play on five straight days. so naturally, he sat out the final April game with Texas, right? not exactly. what was originally supposed to be a scheduled off day for Dr. Smooth turned into his first pinch hit appearance of the season late in the contest. unfortunately, he grounded out in his only AB of the night to go 0-for-1, ending the modest 7-game hitting streak at home and 9-game on-base streak at home that he'd had. and so Michael wrapped up April with an 8-for-20 showing on the homestand. what do you think about Michael's performance so far? leave me a comment! 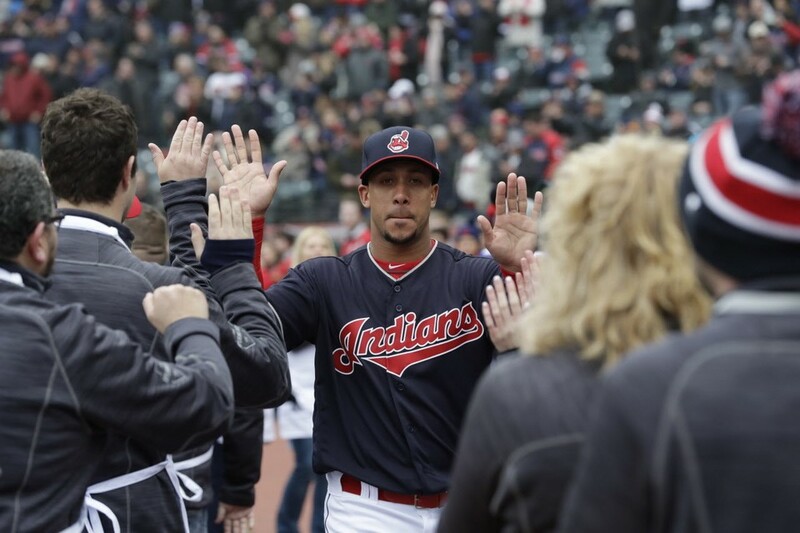 the beginning of the end of the Michael Brantley era in Cleveland began with the Indians' Home Opener on April 6. prior to the game versus the Kansas City Royals, the Indians announced that he had been activated from the 10-Day DL. the timing couldn't have been better, as it enabled Michael to experience his final Home Opener with the Tribe on the field. ahead of the game, Michael spoke to the media and, according to Paul Hoynes' cleveland.com article, he admitted he was nervous. "last night, i couldn't sleep. absolutely. i enjoy this game. i couldn't sleep last night. i'm nervous right now speaking to you guys. i've got that nervous energy. it's fun. it's exciting. playing the home opener in front of your fans is something you look for. you work all offseason to get to this moment. and to be able to do it, and hear the crowd roar when they hear your name, it's special. you just can't forget it. these are special memories." 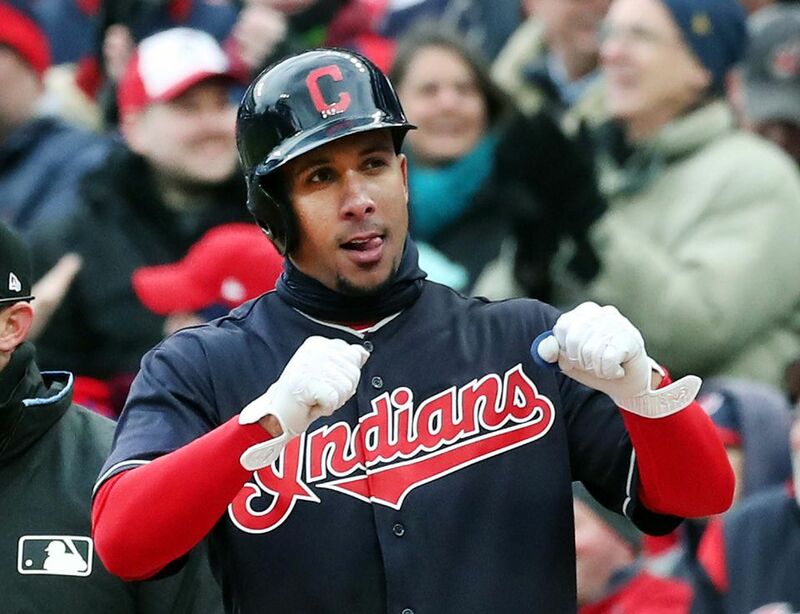 Michael also offered some expert advice for dealing with the cold weather in Joe Noga's article for cleveland.com, including dressing in layers and barreling up the ball. "hit it on the barrel, good things happen. hit it on the end, yeah, it's going to be a little bit of a sting." he got his second at bat in the bottom of the 3rd inning with 2 outs and the Indians still on top, 3-2. Michael was behind in the count, 1-2, and then strike 3 was called. the pitch sequence went: called strike, called strike, ball, called strike. the second called strike should have been a ball though. Duffy opposed Michael for the third time in the bottom of the 6th inning with the Tribe still up, 3-2. after a full count, Michael grounded out sharply to 3rd base for the 1st out of the inning. when Michael led off the bottom of the 8th inning, the score was the same but Royals left-handed reliever Tim Hill was on the mound. Michael hit another groundout, this time to 2nd base, on a 1-2 count. and so Michael ended his first game of 2018 and final Home Opener in Cleveland going 1-for-4 with a go-ahead, 2-run single. following the Indians' victory, Zack Meisel made sure to tweet how Francisco Lindor did his normal leaping high fives with outfielders Rajai Davis and Brandon Guyer. but when Lindor and Michael met up on the field, they hugged as opposed to jumping to high five because "the guy who just returned from ankle surgery was not going to jump." i have to interject here and point out that Michael and Frankie have never jumped to high five when the Tribe wins games. i think Meisel, who questioned the club's decision to bring Michael back, was just trying to be a bit of a smart aleck with this observation.🤷 check it out for yourself in the video from mlb.com/indians. of course, Michael was interviewed after the win on the field by SportsTime Ohio in-game reporter, Andre Knott. i transcribed the most pertinent parts from FOX Sports Ohio's youtube channel. why was he aggressive in the 1st inning when he's not an overly aggressive hitter? "first at bat jitters, i guess. i wanted to be aggressive, i wanted to hit a fastball early. it was a perfect pitch, it was right on the inside corner of the plate, i was lucky enough to get just enough barrel to get it over 2nd. it wasn't perfect, but i'll take it any day of the week. ...it's gonna look great in the paper, looks like a line drive to right but uh, hey, it helped us get a victory tonight." does it excite him that he couldn't sleep last night and how he still gets jitters before the Home Opener? "it's the passion i have for this game, it's the love i have for this game. there's nothing like Opening Day. you work so hard in the offseason just to come to Opening Day in front of your home fans and uh, just enjoy it. i mean, this is what you play baseball for. it's fun, exciting, and i feel like a little kid again, right?" "it's definitely not hot," Michael agreed with Knott when talking about the cold weather. "it's that wind. that wind was no joke today. it was not fun, especially out there getting hit in the face and uh, like i said before the game, we gotta be one run better than the Royals and we did it. we'll do it again tomorrow and just go back out there and you know give it our best in this weather." later in the media room, Hoynsie asked Michael what's allowed him to have success against Duffy, who since 2016 has been tough on lefties. in a youtube video on the cleveland.com channel, Michael replied, "i don't know that answer. but, at the same time, he's a great pitcher. he has three great pitches that, you know, he has a fastball, slider, and a changeup that he throws all to lefties. and you know, he pounds the zone and, you know, he does a great job at it. you know, we did a great job of just making him work today. i think, you know, our overall approach as a team was very good." Michael also described the typical approach in his first at bat situation against Duffy in a video on mlb.com/indians. "usually, it's take some pitches and make sure he gets in the zone, but for myself personally, i had a lot of at bats against Duffy in the past and i was just trying to get a fastball early and just trying to put a good swing on it. like i said before, i had some nervous jitters in my first AB of the year. i was excited. so uh, he made a great pitch. i was able to just get enough of it just to get over 2nd base. i'll take it all day." in another video from cleveland.com's youtube, Michael discussed playing in the cold weather. "i said it before, you gotta do it just like they gotta do it. we gotta be one run better than them at the end of the, end of the game and we did that today. we can't make no excuses. it wasn't fun to play in any means, we all know that. but, at the same time, you go out there and you get your job done as a professional, do everything you can just to get you know, scratch a run across here or there, you know, just taking the lead." during Terry Francona's presser after the game, a reporter inquired what Michael means to the team. "so much," the manager endorsed in a video on mlb.com/indians. "i mean, he's an easy guy to bet on. i mean, i could give you pages and pages of why. he just, he's the heart and soul of our team. he does everything the way you're supposed to. if you saw him, if people saw the way he works to get healthy, it would be hard to bet against him or to ever want to bet against him." additionally, Francona was particularly impressed that Michael's go-ahead, 2-run single came on Michael's first swing of the at bat. "...i know he didn't scald it but, he stays on the ball with a runner on 3rd and less than two outs so well, that he gets rewarded for hits like that because he doesn't roll over and hit that ball to 2nd on a double-play ball. he's one of the best i've ever seen at that." in Bastian's postgame article on mlb.com/indians, Michael concluded the home opener was worth his sleepless night. "absolutely. we got a win." Michael will meet with Francona and the training staff daily, with Michael giving feedback, and they will map out a schedule for his future games. "i feel great right now as we speak," Michael stated, "and that is all that matters. one day at a time. i understand that i've been banged up for the last couple years, but at the same time, i'm as focused as ever." "it's great to see him in the clubhouse," Lindor shared. "it's awesome whenever you see Brantley back in the game. he's somebody who's going to help us a lot. he's proven that he's going to help us. he's a guy that we need. i'm happy for him. hopefully, he can come back and be how he was." Lindor isn't the only one of Michael's teammates happy that the doctor is in. Andrew Miller, when asked what it was like to see Michael back in the lineup and then come through, laughed in SportsTime Ohio's twitter video, "i think we're starting to come to expect it. i think, you know, it'd be nice if we uh, we just have him every day the rest of the way, that's the big goal because we know he can hit, we know he can play, and uh, he's a big part of this lineup. you put him in there, you know, he's a, he's a daily guy that you just count on to get big hits. and uh, you know, it's interesting cause, you know, Duffy was obviously having a little bit of trouble and then he came out and swung at the first pitch, but, you know, drove in two so, that's the game-maker and uh, you know, obviously nice to have him back and happy for him to, you know, get that moment." in Carlos Carrasco's postgame interview on the FOX Sports Ohio youtube channel, he acknowledged getting Michael back "means a lot. it means a lot. he's been here for a long time. just, when i saw the lineup today, he's in there, i'm just really happy and really close for him and i'm glad he's back." one major lesson Michael has learned from his past injuries is "be patient," he declared in Tom Withers' article on apnews.com. "understand that i'm listening to my body and understand exactly what's going on and how i feel every day and make sure i'm being honest with myself and with this team. i'm feeling good right now. i'll wake up tomorrow and we get to do it again. that's all i'm looking forward to, one day at a time, playing as many games as i can." as it was explained prior to Michael's activation from the DL, he was not going to play every game in the early going. "...i think we're probably going to try and use some judgment there," Terry Francona divulged in Jordan Bastian's April 7th Pregame Minutiae blog on bastian.mlblogs.com. "but it's worth it, even if it's two out of three for a while, to have him around. we're a little left-handed, as you can see. there are a lot of red L's on my lineup card, but hopefully we do a good enough job against the starter where that doesn't get in the way." but would the weather potentially get in the way of Michael's playing schedule at all? "i wondered about that myself. he doesn't seem to think it [will matter]. i can't imagine it makes anything feel good. i was watching him yesterday. we were going to run for him if he got on in the 7th or 8th. we were going to run Zim and move Raj to left. when he didn't get on, we kind of went back and forth. those guys had been out there. they knew the way the wind was blowing. Zim throws so well. if they would have got the tying run on third, we were going back and forth, 'do we put Zim out there?' we came to the conclusion that the guys that were out there, let them play, because they had been through it the whole day." 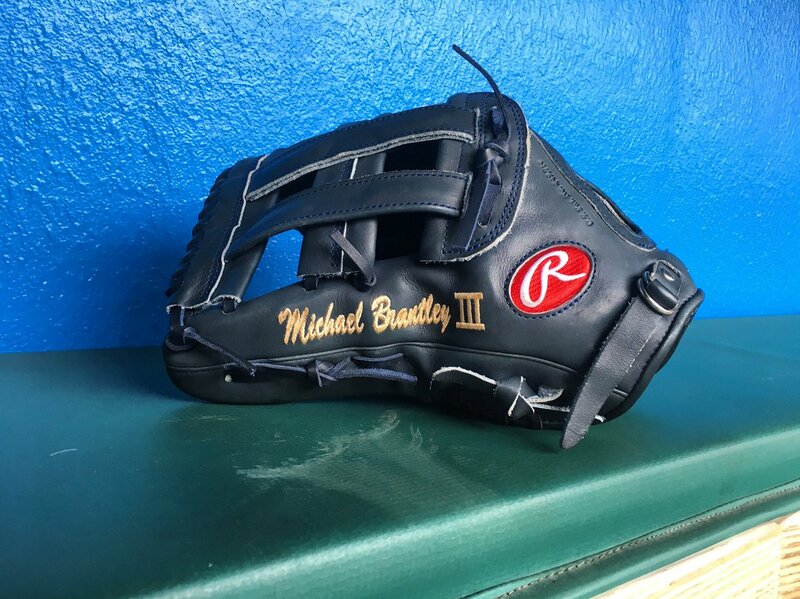 Michael got his first day off on April 9 after playing all three games in the Kansas City Royals series. with a left-handed pitcher on the mound, Francona thought it would be a good time for a break, but was still in awe of how Michael fit seamlessly back into the lineup. from Bastian's article on mlb.com/indians, Tito remarked, "i actually think it's pretty amazing that he just steps in and seems like he picks up where he left off. team-wide, we haven't swung the bat very well, but he looks to me like, 'give him some at-bats and he'll be just fine.'" Michael returned to game action on April 10. via a blurb in an article by Bastian on mlb.com/indians, Francona maintained, "we'll just try to use some common sense with him. he's worked so hard that he deserves the best chance to come back and stay back. if that means us making some concessions at some point, it's really worth it." on April 11, while Michael was batting in the bottom of the 5th inning in the game versus the Detroit Tigers, Jim Rosenhaus told radio listeners on WTAM 1100 that Michael said he feels good and would love to play every day. however, he knows the Indians are being smart with him as he continues to come back from his offseason right ankle surgery. after playing another three straight games, Michael's next day off came on April 13. per Bastian's article on mlb.com/indians, it was either going to be today or yesterday, and Michael chose today. 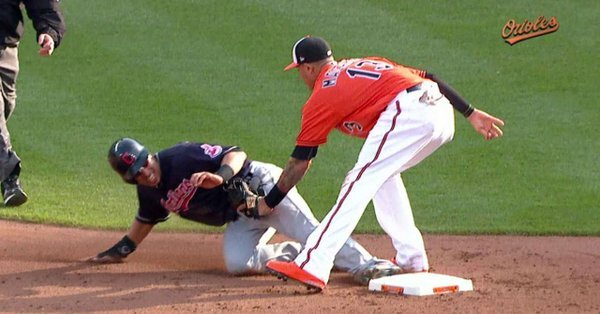 "it was one or the other," Francona informed. "he felt like he felt good, and he wanted to play [Thursday against the Tigers]. so, in my opinion, if you string more together and as long as he's OK, then we keep building him up." the Indians continue to monitor his innings, but Michael wants to be in the lineup as much as possible and has been giving positive feedback along the way. "he's doing really well," Tito affirmed. "he wasn't going to play today, but i thought that he was fighting for it. it was obviously a really good sign." an article by Ryan Lewis on ohio.com further expounded that if Michael continues to feel good enough, the Indians could start to expand how many days in a row he plays, but that is something that could still progress at a slow rate. after playing four straight games for the first time this season from April 20-23, Michael got another scheduled day off on April 24. before the previous day's game, Francona mentioned that might be the case. from Hoynsie's article on cleveland.com, the skipper notified, "he'll get a day off here, maybe even tomorrow. we'll see. but it's nice to have him around." Michael insisted he didn't mind delaying the start of his 2018 regular season. "like i said before, i was going to take my time with it and make sure that when i came back i was ready to help this club win baseball games and play at a high level. i feel like i came back at the right time. i'm able to go out there and compete at a high level and help us win. i'm just happy to be back playing baseball and doing well." "i just think it's his work ethic," explained Tito. "he's just such a pro. he gives himself a chance. he gets here early and gets his work done." in an article by Joshua Needelman for mlb.com/indians, Francona revealed he might sometimes notice something off in Michael's gait still. "i don't think it gets in the way of his game at all. he's swinging the bat really well. he's so reliable in left field. he knows where to go. i think it is pretty bright for us with him." according to Chris Assenheimer's article on chronclet.com, Michael got to decide whether he got a day off on April 23 or April 24. he chose to play on the 23rd. "i thought he made a good decision," Francona confirmed. "nobody knew our plane wasn't going to be ready. if he didn't play (Monday) night and we get home at 3 am, that's not a big break. so i thought it made sense." "i think our team is different when he's here. not just his bat, his presence in the lineup. but his steadiness in the outfield, the teammate he is. the way he competes. i think he makes everybody better. myself included. i know it's a nice feeling during a game when he's here." before the game versus the Chicago Cubs on April 25, Tito spoke about Michael looking like himself at the plate again in Bastian's Pregame Minutiae blog on bastian.mlblogs.com. "it seems like it, which isn't as easy as it sounds. it's not just as easy as 'business as usual.' but, for him, it is. i think everybody sees what you see on the field. the swing and everything. i think he's really intelligent. he watches the game. his swing has such little maintenance. i hate to say it almost. he's such a hard worker. i don't want people to think he wakes up in the morning and [doesn't put the work in], but it's just so sound. if you're talking to a young hitter, you would point to him so often, because it's just so sound." in the offseason, i was worried that if the Indians couldn't re-sign Carlos Santana, Michael would be forced to move to 1st base. but i never ever thought that losing Santana would jeopardize Michael's batting order position. prior to the game on April 7, Terry Francona expressed how Michael impacts the lineup in Jordan Bastian's Pregame Minutiae blog on bastian.mlblogs.com. "he does spread your lineup out--lengthen it out--and, you know, it's amazing how a hitter can kind of make your lineup look different." right now Michael has been branded the Tribe's cleanup hitter against right-handed pitchers and then bats 5th when lefty starters are on the mound. Tito's reasoning is because they're now down one switch-hitter and have a lot of left-handed hitters that he needs to spread out. *the only difference came when Kipnis got a day off at the end of the month and the Indians faced a lefty, then Bradley Zimmer bat 2nd in his place and Michael bat 4th. it's very reminiscent of the beginning of 2014, when Michael alternated between batting 5th and 6th, depending on the handedness of the opposing pitcher. in his 2018 debut on April 6, Michael bat 5th for the first time in a Major League game since April 29, 2014. the next day, on April 7, Michael bat 4th, something he hadn't done in a Major League game since May 9, 2016. i argued against these new BOPs in my Brantley's Cactus League 2018 Rehab #s blog. the main fact i want to reiterate here is how coming into 2018, he had the worst numbers in the cleanup spot with at least 170 career at bats. seems to me that if you want Michael to be the most productive that he can be, and therefore make the team as a whole stronger, then he should be back in the 3rd spot. Tito clearly is not interested in that idea and justified batting Michael, a high-contact hitter, in the middle of the order. per Bastian's aforementioned blog, he disclosed, "everybody has their own opinion on things, but i really like the idea, just what you said. they put the bat on the ball more often than most players do in this era and i like that a lot. you can put guys in motion, they're fast enough where they're not going to just hit into double plays, because they're just putting it in play. i think it really helps. i mean, you see Brant and he'll find a hole somewhere. well, it's not just that he's lucky. he puts the bat on the ball so he's going to get some hits." Michael having to hit in spots that he hasn't regularly hit in for a few years could require an adjustment. he's not going to see the same pitches batting 4th and 5th that he would batting 3rd. i am concerned this could affect his numbers and consequently ruin his chance to finally have a strong season statistically in his walk-year, no less. then in turn, fans will attack him if he's not performing to his usual level in these new BOPs versus 3rd. it's a small sample size thus far, but Michael's been doing well in the cleanup spot. when he's batting 5th, on the other hand, he's having a rough time (as you'll see when you get to the BOP breakdowns toward the end of this post). i won't panic yet because he could turn things around in the upcoming months. so we'll just have to wait and see what happens as the season progresses. when Michael bat 4th, he had Encarnacion and Yonder Alonso batting 5th and 6th behind him, and a mix of Lonnie Chisenhall (before he went on the DL), Yan Gomes, and Roberto Perez batting 7th. when Michael bat 5th, Brandon Guyer, Alonso, Gomes, and Perez typically followed in the 6-8 spots. Alonso is the one batter who drove Michael home all three times that Michael didn't cross the plate as a result of his own home runs. still, the guys batting behind him, no matter his BOP, are not doing a very good job. my boy was left stranded an unacceptable amount last year and i hope we are not in for a repeat of that in 2018.
during Francona's pregame presser on April 28, a reporter questioned when he thinks the offensive sample size is large enough to consider tweaking the lineup. from Jordan Bastian's Pregame Minutiae blog on bastian.mlblogs.com, the skipper contended he's unlikely to move anybody just yet. "i don't think it's so much of that. yeah, you want to let guys settle in, but i think if you're going to make a tweak, there has to be a reason, not just a reason for the tweak, but, OK, what's going to happen when you do that? like, if you take somebody and move him from here to here, well, what happens there? or, are you taking a guy that's hitting down in the order and he's actually doing OK, if you move him up, he may struggle. i think there's a lot of things that go into it. and, with me, if it's a veteran player, i want to make sure i know there's a reason to move somebody. and, until i'm sure, i'd rather just stay put." between the amount of fans and several writers who were openly against the Indians' decision to exercise Michael's club option, and Francona remaining adamant about his new (lower) placement in the order, i feel like Michael's practically getting pushed right out the Tribe door into free agency. it just really irks me knowing that had Michael never gotten hurt, he'd still be batting 3rd because no one would have taken his spot while he was out. 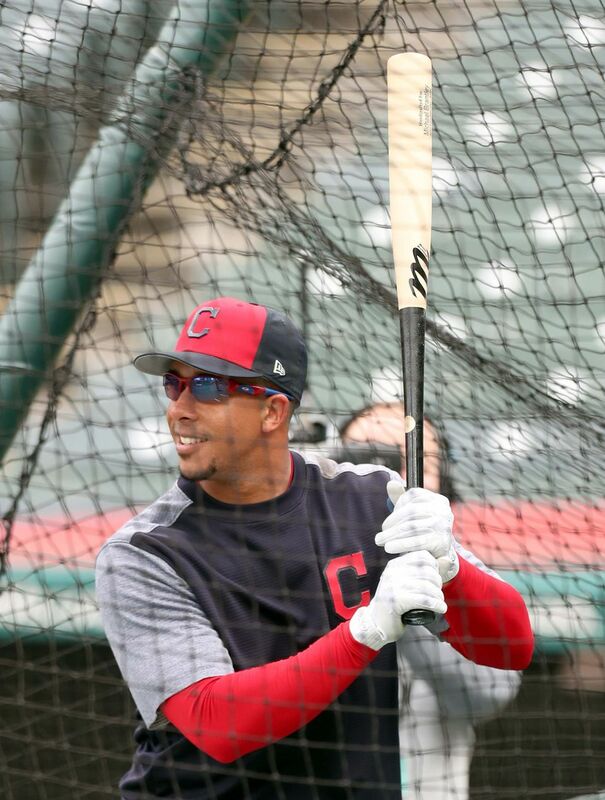 he's our most consistent hitter and he should be batting 3rd to finish out his time with the Indians. and no one will be able to convince me otherwise. i don't like that our only two switch hitters are in the first three spots of the order and i think Ramirez should be moved back down to 5th to balance things out. why is Francona so afraid of having Kipnis and Michael bat back-to-back all the sudden? speaking of, i really don't like Kipnis batting 2nd either, especially since he's been struggling. why did Michael have to get moved down, but Kip got to stay up top? i wonder what would have happened if that trade with the Mets had worked out and Kipnis wasn't on the team anymore... oh, who am i kidding? Brantley would still be batting 4th and 5th. what do you think our starting 9 should look like versus righties, lefties, or both? leave your thoughts in the comments below! i think it's still a bit early in the season for me to have any real concerns, but i can pick out a few things to watch for going forward. Michael's performance with RISP and 2 outs needs improvement. for whatever reason, this seems to be an area that he's had trouble with in for the past few seasons and so far this year, that's continued. right now, Michael only has one walk. ordinarily, he works the count more and has a higher base on balls total. he's definitely been really aggressive at the plate to start the year, but that strategy is working out well for him so i'm not going to complain too much. as this season progresses, i'm sure his walks will increase. Michael hasn't been very effective against left-handed pitching yet in 2018. usually, his RHP and LHP splits are similar, or at least both acceptable. that's not the case for Michael currently. then again, he's faced less southpaws than righties, so maybe as his at bats build up, his numbers against lefties will look better. lastly, Michael's outfield assists, or lack thereof is maybe not so much concerning as it is disappointing. he had some opportunities to throw out runners on a few occasions, but his throws were either a bit off or the guy he threw to couldn't handle the throw. perhaps he simply needs more time in the field to regain his accuracy. i might also mention that he's played numerous games where he didn't even record any putouts, so that's abnormally low at the moment as well. i hope those both change in the coming months. what are your areas of concern for Michael? let me know in the comments! this month, Michael only played in 18 games and so he is not a qualifying player right now. (actually, he probably won't be one until June if he keeps getting days off after playing four to five games in a row.) it is mandatory that a player total at least 3.1 plate appearances per team game played, or 502 PA by the end of a season, in order for him to be deemed a qualifier and eligible for the batting title competition. for March/April, a Tribe player needed at least 83 plate appearances to qualify. going into May, Michael currently has 2.7 PA per game and therefore, his .343 batting average cannot be ranked among the rest of the qualifying players on the Indians. the player who had the highest March/April batting average out of all the qualifiers on the team is Jose Ramirez with his .267 BA. the next closest average was .245, owned by Francisco Lindor. in March/April, Michael led the team with 1 triple and he was tied for 1st with 1 sac fly. he was tied for 2nd on the team with 16 singles. in addition, he was 3rd with 24 hits and tied for 3rd with 5 doubles. among the outfielders, he was 2nd with 154.0 innings and 17 games started. Michael did not set any career highs for himself in March/April. Michael hit 2 home runs in March/April. his first homer of the year actually came in his seventh game, which was the fastest he's ever hit a home run to begin a season. it's no secret that the weather hasn't been all that warm yet and that's caused a few of his high fly balls to stay in the park. i'm confident that when the temperatures rise, so will Michael's HR totals. the team leader in home runs right now is Yonder Alonso with eight. Jose Ramirez is behind him with 7 and Edwin Encarnacion has 6. no other Indians player has more than 4.
in March/April, Michael totaled 10 RBI and left 20 men on base. with the BOP change, i was worried that he wouldn't get much of a chance to drive in his usual amount of runners. thus far, he's come to bat more with the bases empty than with runners on, so it was and still is a valid concern. the team leader in RBI right now is Alonso with 21. Ramirez has 16 ribbies, Lindor has 11, and Encarnacion has 10, just like Michael. time for the March/April HR:RBI ratio. both of Michael's 2 home runs were solo. therefore, 20% of his 10 RBI in March/April came from his (solo) homers. Michael's K rate in March/April was 6.8% (5 K/73 PA). he's presently striking out once every 14.6 plate appearances. no, he didn't play a full month, but this is still really excellent and vintage Michael. Bastian's article on mlb.com/indians further unveiled that going into April 24, Michael also had a 5.8% strikeout rate in 2018, which ranked 3rd overall in baseball. 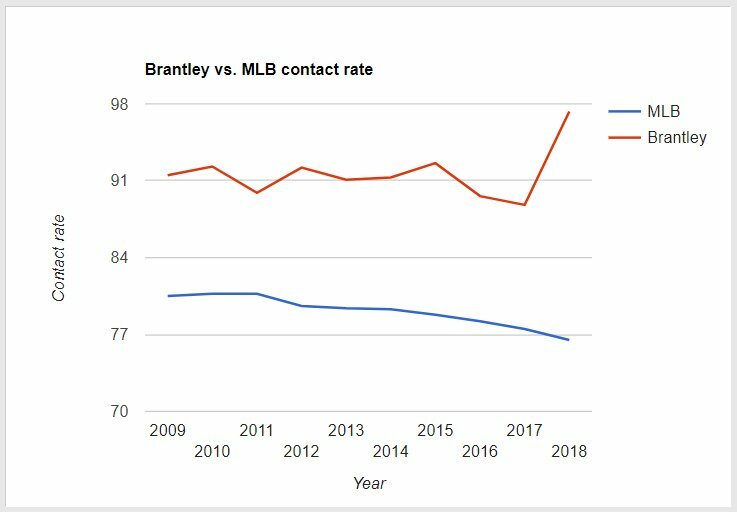 MLB's strikeout rate for 2018 on this date was 22.9%, up from 18% when Michael debuted in 2009. in addition, MLB's 2018 contract rate was 76.5% compared to 80.5% in 2009. "we're just in a different day and age now," Michael rationalized. "computers and stuff are telling us different things. everybody wants to talk about launch angle. it's just a different time. i don't know how to explain it -- the evolution. i just know what's been successful for me in the past and what's worked for me in the past, and i don't want to change. i had success doing it my way, and i'll continue to do it my way. that's hitting line drives and getting the barrel to the ball as consistent as possible. it's something i pride myself on, and i will continue to do it." Terry Francona is a fan of Michael's ability at the plate as well. "maybe it's because i'm older, but i like it. just the idea of making adjustments with two strikes and taking what the other team gives you, hitting the ball the other way, i really do like that." aside from strikeouts, Michael's other outs* came from 21 groundouts, 10 flyouts, 6 lineouts, and 4 pop outs. as per ush, he's getting the barrel to the ball and making contact more often than not, or way more often this month. that's great to see. *the sortable player stats section on indians.com denotes outs differently from my own in three distinctive ways. first, despite the site specifically stating that the flyouts total does NOT include line drives, it absolutely does. (it also includes pop outs.) second, when Michael grounds into a double play, that is counted as two groundouts on the site, due to two outs being recorded in an inning. however, in my personal documentation, i only count a GIDP as one out, because for Michael, it is only one out/one at bat/an 0-for-1 in his game line. and third, likewise with the GIDPs, i do not count sac flies as flyouts here. even though they are outs in a game, they don't count against Michael in his game line because sac flies are considered plate appearances and not at bats. Michael had a hit in 14 of the 18 games he played in March/April and reached base safely in 15 games. he had 4 hitless games, but still reached base in 1 of them. Michael had 8 multi-hit games, 2 three+ hit games, and 3 multi-RBI games. he had at least one RBI in 7 games. he also had 2 go-ahead hits and 3 go-ahead RBI this month. the Indians were 12-6 in games that Michael played in and 3-6 in the games he missed/sat out. Michael had an 18-game on-base streak on the road between July 1 - August 1, 2017, and April 16-22, 2018. it spanned over July 1-2, July 14-19, July 28-29, and July 31 - August 1, 2017, and April 16-17 and April 20-22, 2018. Michael had a 14-game hitting streak on the road between July 15 - August 1, 2017, and April 16-22, 2018. it spanned over July 15-19, July 28-29, and July 31 - August 1, 2017, and April 16-17 and April 20-22, 2018. Michael had 5 consecutive multi-hit games between April 11-20. they spanned over April 11-12, April 17-18, and April 20. Michael had a 9-game on-base streak between April 8-22. it began on April 8, then continued over April 10-12, April 17-18, and April 20-22. Michael had a modest 7-game hitting streak, in which he bat .424 (14-for-33), between April 11-22 (over 12 days). it spanned over April 11-12, April 17-18, and April 20-22. Michael had a 9-game on-base streak at home between April 8-29. it began on April 8, then continued over April 10-12 and April 25-29.
finally, Michael had a 7-game hitting streak at home between April 11-29. it spanned over April 11-12 and April 25-29.
in March/April, Michael bat .378 (17-for-45) against right-handed pitchers and .280 (7-for-25) against left-handed pitchers. i think as he gets more at bats against southpaws, that average will go up. Michael bat .341 (14-for-41) with 6 RBI in 12 of 15 games at home. he hit safely in 9 of the 12 home games he played in and safely got on base in 10 of them. he had 3 hitless games at home, but still reached base in 1 of them. he had at least 1 RBI in 4 home games. Michael bat .345 (10-for-29) with 4 RBI in 6 of 12 games away from Progressive Field. he hit safely in 5 of the 6 road games he played in and safely reached base in 5 of them. he was hitless in 1 road game and did not reach base in it. he had at least 1 RBI in 3 road games. Michael hit .333 (6-for-18) with runners in scoring position, producing 8 RBI in March/April. breaking that down, he hit 1.000 (1-for-1) with RISP and 0 outs, .500 (4-for-8) with RISP and 1 out, and .111 (1-for-9) with RISP and 2 outs. clearly, his 2-out hitting with men on 2nd and/or 3rd base needs to improve. immensely. additionally, he bat .400 (12-for-30) with 8 RBI with runners on base and 1.000 (1-for-1) with 2 RBI with the bases loaded. Michael also bat .300 (12-for-40) with the bases empty. he hit 1 double, 1 triple, and 2 home runs. he totaled 2 RBI, 1 walk, 1 hit by pitch, and 4 strikeouts (2 looking, 2 swinging) as well. vs. the Kansas City Royals, Michael bat .182 (2-for-11) in 3 home games in March/April. the Indians went 2-1 in the games he played in. overall, Michael had 2 singles, 2 RBI, 1 walk, 2 first at bat hits, and 2 total bases. he also had 2 strikeouts looking and left 2 men on base. furthermore, he had a .250 OBP, .182 SLG, and .432 OPS. in left field, Michael recorded 3 putouts while playing 27 innings/3 complete games. considering that this series was played in very cold conditions, which certainly took a hit or two away from Michael, i am not concerned with this subpar showing. vs. the Detroit Tigers, Michael bat .400 (4-for-10) in 3 of the 4 home games in March/April. (he had 1 scheduled day off during the series.) the Indians went 3-0 in the games he played in and won the game he did not play in as well. overall, Michael had 3 singles, 1 extra base hit--a double, 2 RBI, 1 run, 1 hit by pitch, 1 stolen base (2nd), and 5 total bases. he also reached base on 1 fielder's choice and left 1 man on base. furthermore, he had a .455 OBP, .500 SLG, and .955 OPS. in left field, Michael recorded 2 putouts while playing 24 innings, but only 2 complete games. he was lifted for a pinch runner in the bottom of the 6th inning in 1 game because the Indians were winning a blowout and Terry Francona wanted to give him some extra rest. this was a great series for Michael. vs. the Minnesota Twins, Michael bat .417 (5-for-12) in 2 road games in March/April. the Indians went 1-1 in the games he played in. overall, Michael had 3 singles and 2 extra base hits, including 1 double and 1 home run, as well as 2 RBI, 1 run, 1 first at bat hit, and 9 total bases. he also had 1 GIDP and left 4 men on base. furthermore, he had a .417 OBP, .750 SLG, and 1.167 OPS. in left field, Michael recorded 5 putouts while playing 23 innings, but only 1 complete game. he was subbed out defensively after 8 innings in 1 game because the Indians were winning and Michael had done more than enough in the game. this little series in San Juan, Puerto Rico, was not only fun, but also productive for Michael. the Indians did not face the Chicago White Sox in March/April. until last season, Michael did not have a very good track record in Interleague Play. hopefully he continues to improve on that this year. in March/April, he played one of two games against one National League opponent, going 1-for-4 and batting .250 overall. as i previously explained in the Team Batting Winner section of the blog above, Michael is not currently a qualifying player. therefore, his BA, OBP, SLG, and OPS all cannot be fairly ranked among other qualifiers around the league. in addition, his strikeouts total does not resemble a full month either, so i can't compare that stat here either. among qualifying left fielders in the American League, Michael ranked tied for 3rd in triples (1); 4th in hits (24); tied for 4th in extra base hits (8), doubles (5), and total bases (37); tied for 5th in hit by pitches (1); tied for 6th in sac flies (1); 7th in singles (16); tied for 7th in home runs (2); 8th in RBI (10); tied for 8th in stolen bases (1); and 9th in at bats (70). among qualifying outfielders in the American League, Michael was tied for 9th in triples. among qualifying players in the American League, Michael did not have any stats that rank in the Top 10.
among all qualifying left fielders in the Major Leagues, Michael was tied for 7th in hit by pitches and tied for 8th in triples and sac flies. among all qualifying outfielders in the Major Leagues, Michael did not have any stats that rank in the Top 10.
among all qualifying players in the Major Leagues, Michael did not have any stats that rank in the Top 10.
in Michael's fifth game back with the Tribe, he obtained several firsts for the season, with the most noteworthy being his first multi-hit game of 2018. on April 11 versus the Detroit Tigers, he went 2-for-4 at the plate. the first hit came in his second at bat in the bottom of the 4th inning. Jose Ramirez was at 1st base with no outs and no score. 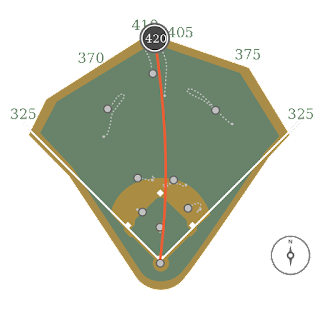 Michael swung at left-handed pitcher Daniel Norris' first pitch and hit a sharp ground ball single into right field, which advanced Ramirez to 2nd. Edwin Encarnacion struck out next and then Yonder Alonso stepped into the batter's box. as the first pitch, a called strike, was thrown to him, Ramirez and Michael pulled off a double steal. that represented Michael's first stolen base of the year! 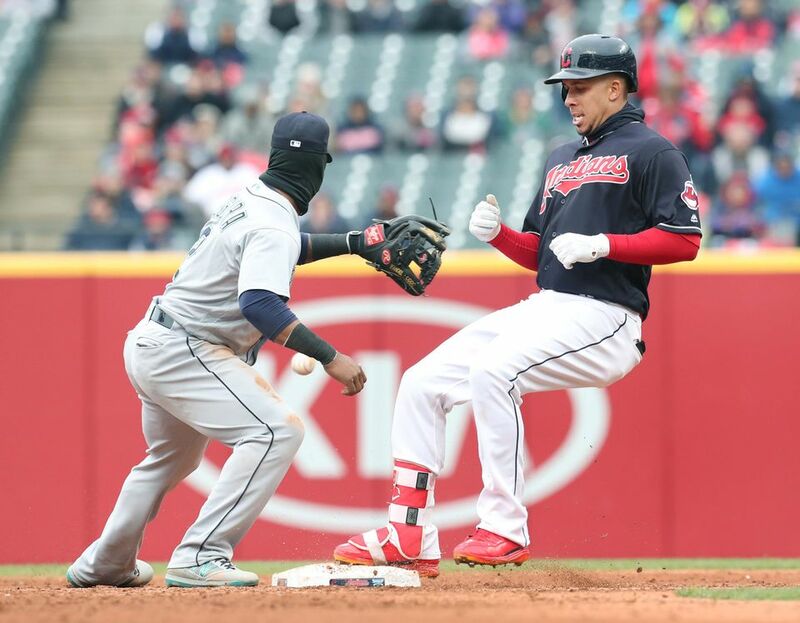 in Paul Hoynes' article on cleveland.com, Terry Francona explained that the key to a successful double steal is the trail runner, who has to stay in step with the lead runner, but also beware in case he doesn't get a good jump and has to go back. "the trail runner, that's the hard thing. say Jose tries to go and he doesn't get a jump. you can't just go on first movement when you're on first base." Michael said, "i'm watching Josie. you have to make sure he commits. you have to keep your head up." later, on a 1-2 count, Alonso smacked the ball into right field for a 2-run single, and so Michael scored his first run of the campaign (after having been left stranded his previous four times on base in his first four games). in the bottom of the 7th inning, with 1 out, Jason Kipnis at 2nd base, and the Indians up, 4-1, Michael faced right-hander Buck Farmer. first pitch swinging, Michael sent another ground ball single into right field that scored Kip and extended the lead to 5-1. Michael got his second straight multi-hit game the following day on April 12 when he went 2-for-4 again versus the Tigers. 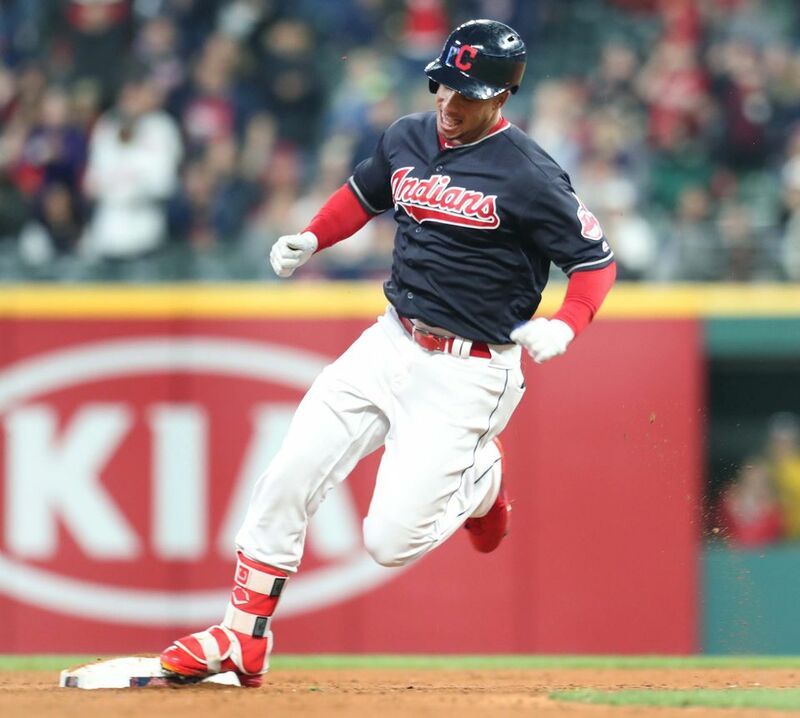 the Indians already had a large lead, 8-1, in the bottom of the 4th inning when Michael came to bat with 1 out, Francisco Lindor at 3rd base, and Kip at 1st. lefty Chad Bell was pitching and after running the count full, Michael popped out into foul territory on the 3rd base-side. however, the ball literally bounced in and out of 3rd baseman Jeimer Candelario's glove. Candelario was charged with a fielding error, which allowed the at bat to continue. lucky break for Michael because on the next (7th) pitch, he hit a sharp line drive off the wall in right field. 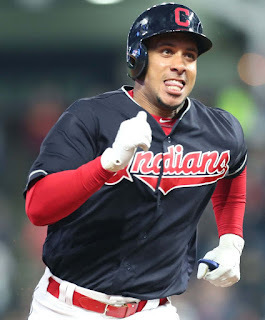 it was good enough to score Lindor, move Kip to 3rd base, and give Michael an RBI double, his first double of the year and first extra base hit of the year! the pitch sequence went: called strike, foul, ball, ball, ball, pop up/fielding error, double. his other hit of the game was also against southpaw Bell. Michael led off the bottom of the 6th inning with the Tribe still dominating, 9-1. after a 2-1 count, he hit a line drive single to center field. because the game was a blowout, Michael was then lifted for pinch runner, Brandon Guyer. 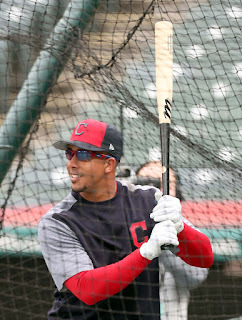 it was a whole night of firsts for Michael on April 17. he recorded his third straight multi-hit game and first three-hit game of the season, as he went 3-for-5, when the Indians were in San Juan, Puerto Rico, to play the Minnesota Twins. the Tribe was designated as the away team. this was the first road game that Michael played in 2018 and coming into it, he had an active 9-game hitting streak on the road, spanning from July 15 - August 1, 2017, and 13-game on-base hitting streak on the road, spanning from July 1 - August 1, 2017.
aside from that, Hiram Bithorn Stadium's field is astroturf. the last time Michael played on astroturf was September 2, 2015, against the Toronto Blue Jays at the Rogers Centre! playing on turf in the past has been tough on his back and i worried it might be not good for his ankle, but everything seemed okay. it definitely didn't negatively affect his bat. Michael's first hit occurred in the top of the 4th inning with 1 out and no score. after a 2-0 count from right-hander Jake Odorizzi, Michael hit a line drive double to left-center field. that gave him a 10-game hitting streak on the road and 14-game on-base streak on the road. in addition, it was his first ever extra base hit off Odorizzi, as he was 2-for-9 with two singles lifetime against him prior to the game. with the Indians up, 3-0, in the top of the 6th inning, Michael came to bat with no outs. he swung at Odorizzi's first pitch, and sent a fly ball to deep right-center field for his first home run of the campaign! this also represented the quickest Michael has ever hit a home run to begin a season (in his seventh game); last year, he hit his first homer in his eighth game of the year. (prior to that, his first long ball in 2014 came during Game #13.) following the long ball, Odorizzi was taken out of the game. when Michael got his next AB, the Indians led, 4-0, and had Kipnis at 2nd base, Ramirez at 1st, and 2 outs in the top of the 7th inning. facing right-handed reliever Alan Busenitz, Michael took a ball before hitting a ground ball single into right field that scored Kipnis and extended the Tribe's lead. Ramirez also moved up to 3rd base on the throw home. the RBI single then gave Michael his third hit of the night and a multi-RBI game, his second of the year. in Jordan Bastian's postgame article on mlb.com/indians, Michael spoke about the crowd at the stadium. "it's almost like a postseason game, or Opening Day. the constant buzz. they're ready to make noise. it was fun. it was a great atmosphere. it was electric. it really was." during his presser, Terry Francona also praised Michael for his performance in the game. "Brantley took some tremendous swings. that was good to see." the next day, Hoynsie's cleveland.com article included another quote from Michael. "it was phenomenal. after i hit the homer, i was out there in left field, having a good time with the fans. it was an electric atmosphere. it was fun playing in front of them." in the finale contest against the Twins on April 18 (which lasted 16 innings! ), Michael acquired his fourth straight multi-hit game when he went 2-for-7. in his first at bat in the top of the 1st inning with no score, 2 outs, and Ramirez at 1st base, Michael faced right-hander Jose Berrios. after a full count, Michael hit a fly ball to shallow center field that dropped in for a bloop single. that gave him an 11-game hitting streak on the road and 15-game on-base streak on the road, along with an overall 6-game on-base streak. Ramirez advanced to 3rd on his hit as well. the pitch sequence went: ball, pickoff attempt at 1st, ball, foul to the left side, called strike, ball, single. Michael got his second hit in the top of the 9th inning with 2 outs. right-handed reliever Fernando Rodney was pitching for the Twins in the still scoreless game and after an 0-1 count, Michael hit another bloop single into center field. when the Indians played against the Baltimore Orioles on April 20, Michael had yet another multi-hit game with a 2-for-4 showing. in the top of the 1st inning, the Indians had Kipnis at 2nd base and Ramirez at 1st with 1 out and no score. 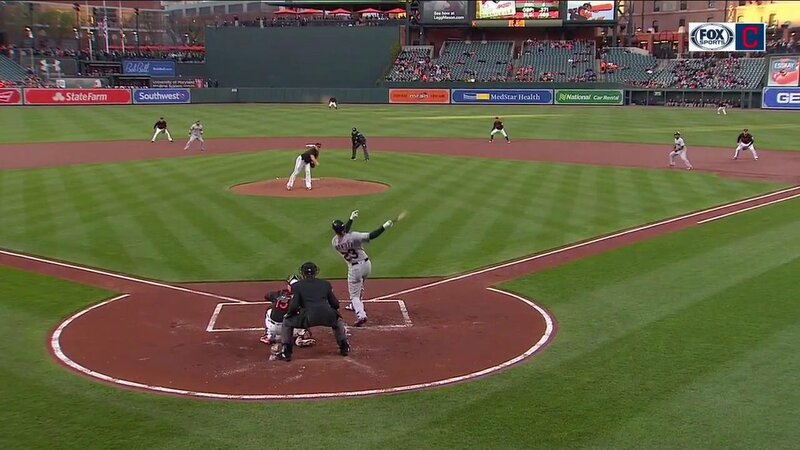 then Michael came to bat against right-handed starter Dylan Bundy for the first time in his career. after swinging at Bundy's first offering, Michael sent a line drive single into left-center field. the hit marked a 12-game hitting streak on the road and 16-game on-base streak on the road for Michael, as well as a modest 5-game hitting streak overall and 7-game on-base streak. in Michael's second at bat in the top of the 3rd inning with 2 outs and the Indians up, 1-0, he hit a ground ball to right field after a 1-2 count from Bundy, good for a standup double. the pitch sequence went: called strike, ball, foul down the left field line and into the seats, double. and that gave Michael his fifth consecutive multi-hit game, tying a career high! on April 21, Michael achieved another first for the year in the game against the Orioles, but not necessarily one that he wanted. let me first describe his lone hit of the game in the top of the 6th inning against righty Chris Tillman. the Indians led, 3-0, and after a 1-0 count, Michael hit a sharp line drive single into right field. the base knock extended all his streaks, giving him a 13-game hitting streak on the road, 17-game on-base streak on the road, 6-game hitting streak overall, and 8-game on-base streak overall. unfortunately, Michael was caught stealing for the first time this season shortly after. before Yonder Alonso's at bat began, Tillman threw to 1st base to try and pick off Michael. then when the count was even at 1, Michael started running towards 2nd base as ball 2 was thrown. Michael had a good jump, but Orioles' catcher Chance Sisco made a good throw to 2nd and Michael was tagged out. it was only his second attempt to steal a base this year. it kind of reminded me of early on in his career, when he'd get thrown out in his first attempt to steal. that happened in 2010, 2012, and 2013.
the SportsTime Ohio TV broadcast also noted that Michael was looking in as he ran, which you can see in the above linked video, as if to indicate he thought Alonso was going to make contact or get a hit. that might have actually cost him the base. in hindsight, Michael should have just stayed where he was because after a 3-1 count, Alonso hit a home run. strange fact: this was Michael's first caught stealing since April 21, 2017, on the road against the Chicago White Sox. he was caught stealing just once last season in 12 attempts. while it didn't result in a hit, Michael did drive in the first run of the game in the top of the 1st inning with an RBI groundout. the AB started with Kipnis at 2nd base, Ramirez at 1st, and 1 out. Tillman's first pitch to Michael was wild, which advanced both runners up a base. then on a 3-1 count, Michael grounded out to 2nd base to score Kip and give the Tribe the 1-0 lead. Michael had another multi-hit game when he went 2-for-5 on April 22 against the Orioles, giving him six total in his last seven games. the first hit came with Lindor at 2nd base, Ramirez at 1st, and 1 out in the top of the 5th inning. the score was tied at 3 and on the first pitch from right-handed pitcher Andrew Cashner, he sent a sharp line drive single to left field. Lindor scored and that gave Michael a go-ahead RBI for the second day in a row and of course a go-ahead hit. the RBI single increased all his streaks as well, giving him a 14-game hitting streak on the road, 18-game on-base streak on the road, 7-game hitting streak overall, and 9-game on-base streak overall. then in the top of the 7th inning with 1 out and the Indians still up, 4-3, he faced right-hander Miguel Castro. on the 7th pitch of a 2-2 count, he hit another sharp line drive, this time to right field, for a double. 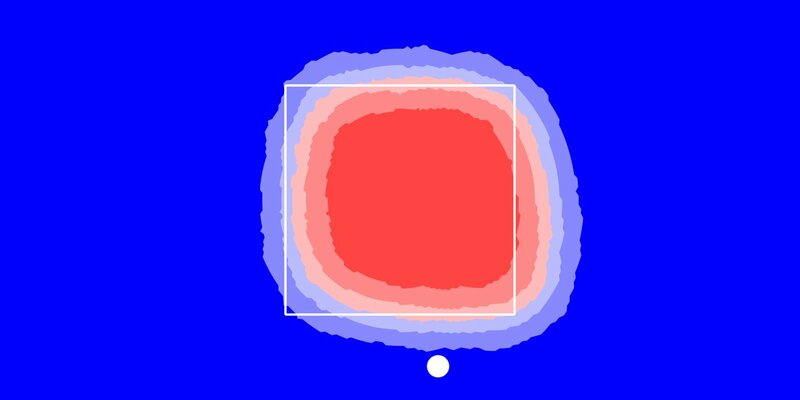 the pitch sequence went: ball, called strike, ball, foul 3rd base-side, foul, foul straight back, double. on April 27, Michael had a 3-hit/perfect night at the plate, going 3-for-3 with a single, triple, home run, and two RBI versus the Seattle Mariners. he got his first at bat with 2 outs in the bottom of the 1st inning and the Indians up, 1-0. he sent a 1-0 pitch from right-hander Erasmo Ramirez to dead center field for his second home run of the season! according to MLBBarrelAlert, Michael hit an 88.4 mph two-seam fastball a distance of 420 feet, with an exit velocity of 105.3 mph and launch angle of 25 degrees. when Michael next stepped to the plate in the bottom of the 3rd inning, Kipnis was at 3rd base with 1 out and the Indians leading, 3-0. after a 2-2 count from Ramirez, Michael hit a high fly ball to center field that almost made it out of the park for home run #2 of the night, but it was caught at the wall. Kipnis scored and Michael was credited with an RBI sac fly--the first sacrifice fly hit by an Indian this year. the pitch sequence went: ball, called strike, ball, foul, sac fly. in the bottom of the 5th inning, Michael faced Ramirez again with 2 outs and the Tribe still on top, 4-0. first pitch swinging, Michael sent a sharp fly ball to center field that Dee Gordon couldn't catch. that resulted in Michael's first triple of 2018 and 18th of his career! the pitch from Ramirez was a 90.6 mph four-seam fastball, per MLBBarrelAlert, that Michael hit 388 feet, 104.2 mph at a launch angle of 29 degrees. Indians twitter also publicized that that was the first triple hit by a Tribe player this year. i never saw that coming lol keep in mind, this was Game #24 for the Indians vs. Game #15 for Michael. in addition, this marked only the second time in Michael's career that he hit a homer and triple in the same game, with the previous coming back on August 7, 2011! his third hit materialized when Michael led off the bottom of the 7th inning with the Indians ahead, 6-2. after fouling left-handed reliever Wade LeBlanc's first pitch 3rd base side, Michael hit a ground ball single into right field. following the Tribe's win, Michael was interviewed on the field by in-game SportsTime Ohio reporter Andre Knott. i transcribed the parts specifically pertaining to Michael's hitting from a video on SportsTime Ohio's twitter. how nice is it to have a night where everyone was able to get some big hits tonight? "well, it's huge. i mean, you know, hitting's contagious. uh, we feed off one another. uh, we wanna go out there and, you know, put up the best at bats possible and, you know, uh, you know, kinda pass the torch one at bat at a time and keep it going." Knott then joked he didn't know Michael had triples in him still because he's getting old. "i, i got a little bit of wheels left in me every now and then," Michael smiled. Knott next put it out there that Michael was unhappy about his RBI sac fly, and inquired where does Michael keep that drive to want to get a hit every single time no matter what the score or the situation is. "i was happy i got the job done. uh, i stayed inside the ball. uh, i'd like to catch a little more out in front next time maybe, but uh, i was happy to get the job done for my team." not quite satisfied with that professional answer, Knott tried again by asking why was he frustrated and told him to be honest. Michael kept smiling and claimed, "i was happy to get the job done. uh, we got an RBI right there and, you know, Josey did a great job moving [Kipnis] over. i got the situation done." before letting him go, Knott proposed that if he keeps hitting triples, Knott will keep talking to him after games. "nah, we'll slow down on the triples," quipped Michael. "doubles are good, too. doubles are good, too." and from Joe Noga's cleveland.com article, Yan Gomes commended, "it's almost like he never lost a beat. he's the centerpiece of this team and we all know it. having him in the lineup just lengthens it." Michael got another multi-hit game with a 2-for-4 effort versus the Mariners on April 28. his first hit came when he led off the bottom of the 4th inning with the Indians down, 10-1. facing right-hander Mike Leake, he took a called strike before hitting a ground ball single to left field. that gave him a 6-game hitting streak at home and 8-game on-base streak at home. Michael later scored a run on Alonso's 2-run home run to center field. his second hit occurred in the bottom of the 6th inning with Ramirez at 1st base and the Tribe behind, 10-3. Michael swung at Leake's first offering and hit a line drive double to center field. this represented his team high eighth multi-hit game, out of 16 games played total. i think we all know by now that Michael is not going to be seen anywhere other than left field when he's playing defense. this month, he recorded 24 putouts in 24 total chances to yield a perfect 1.000 fielding percentage. as i mentioned above in the Areas of Concern section, Michael didn't see all that much action in left, even just catch-wise. of the 17 games he played in left field, there were seven games in which he had zero putouts. as for the catches he did make, they weren't anything web gem-worthy yet, so i really don't have anything to spotlight defensively this month. i gotta admit, i was quite surprised he didn't manage to acquire any outfield assists. since 2012, when playing at least 15 games in the outfield in the month of March/April, he's always had a minimum of one assist. Michael's arm is still very good and he did have a couple shots at throwing guys out, but they didn't pan out. besides that, maybe players have finally realized that they shouldn't try to run on him. i hope both his putouts and assists can increase as the year continues, but especially his assists because he's normally one of the top assist leaders around the league. we'll have to wait and see how things progress over the next few months i guess. Michael doesn't have any assists for me to rank right now, but when he does finally obtain some, i will be ranking them among AL left fielders, MLB left fielders, all AL outfielders, and all MLB outfielders in my future cumulative #s posts. however, i do want to document that the current MLB OF assist leaders are Kole Calhoun of the Los Angeles Angels, Delino DeShields of the Texas Rangers, Corey Dickerson and Starling Marte of the Pittsburgh Pirates, and Trey Mancini of the Baltimore Orioles, who all have 4.
now let's break down the numbers. i am going to document his March/April #s, the 5th spot #s, the 4th spot #s, the 6th spot #s, and the PH #s, as well as the left field #s, BOP + left field #s, and overall outfield #s.
Michael played in 18 (of 27) games, 15 complete, in March/April. he started and played left field in 17 games, completing 15 of those games, appearing in 17 total. he was lifted for a PR in 1 game in the bottom of the 6th inning because the Indians were winning a blowout. he was subbed out defensively in 1 game after playing a total of 8 innings because the Indians were winning and he had done more than enough in the game. he came in to PH in the bottom of the 7th inning in 1 game. he missed 6 games while he was on the 10-Day DL as he continued to rehab from offseason right ankle surgery and build up his endurance in extended spring training. he got 3 scheduled games off. Michael bat 5th in 4 games. Michael bat 4th in 13 games. Michael played in 15 complete games. March 28: played in a minor league game with the Columbus Clippers in Goodyear, Arizona. Game /4, April 2: still on DL, played in a rookie league game with Double A/Triple A pitching in Goodyear, Arizona. Game /5, April 3: still on DL, played in a rookie league game with Double A/Triple A pitching in Goodyear, Arizona. Game /10, April 9: scheduled day off. Game /14, April 13: scheduled day off. April 14: game postponed, to be made up May 3 at 1:10 pm. April 15: game postponed, to be made up May 3 at 1:10 pm in a traditional DH. Game /21, April 24: scheduled day off. 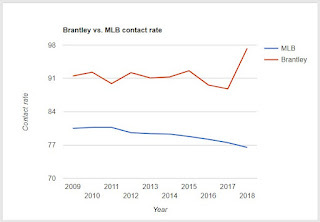 in case you missed any of the Brantley blogs i wrote during the offseason, i will list and link them all here. 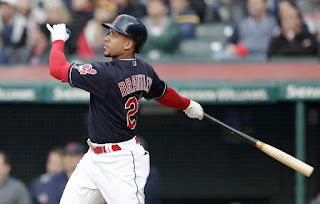 Indians Exercise Brantley's $12 Million Option for 2018!